Nov. 21, 2011, 2:30 p.m. Images can convene attention; they can also distribute it. By Megan Garber @megangarber Nov. 21, 2011, 2:30 p.m.
That could be true (though “very hard,” of course, is quite different from “impossible”). And it could also be true that the features that may give Occupy, potentially, enduring power as a movement — its malleability, its permissiveness, its ability to act as an interface as well as an event — might also be the forces that, day to day, challenge its ability to convene attention. Particularly at the level of the mass culture. But that may well have just changed. This weekend, a series of photographs — images of a riot-gear-wearing cop shooting a group of students in the face with pepper spray — made their transition from journalistic documents to sources of outrage to, soon enough, Official Internet Meme. Perhaps the most iconic image (taken by UC Davis student Brian Nguyen, and shown above) isn’t explicitly political; instead, it captures a moment of violence and resistance in almost allegoric dimensions: the solidarity of the students versus the singularity of the cop in question, Lt. Pike; their steely resolve versus his sauntering nonchalance; the panic of the observers, gathered chorus-like and open-mouthed at the edges of the frame. The human figures here are layered, classified, distant from each other: cops, protestors, observers, each occupying distinct spaces — physical, psychical, moral — within the image’s landscape. Exactly. The image — and its subsequent meme-ification — marked the moment when the Occupy movement expanded its purview: It moved beyond its concern with economic justice to espouse, simply, justice. It became as much about inequality as a kind of Platonic concern as it is about income inequality as a practical one. It became, in other words, something more than a political movement. The image itself, I think — as a singular artifact that took different shapes — contributed to that transition, in large part because the photo’s narrative is built into its imagery. It depicts not just a scene, but a story. It requires of viewers very little background knowledge; even more significantly, it requires of them very few political convictions, save for the blanket assumption that justice, somehow, means fairness. The human drama the photo lays bare — the powerless being exploited by the powerful — has a universality that makes its particularities (geographical location, political context) all but irrelevant. There’s video of the scene, too, and it is horrific in its own way — but it’s the still image, so easily readable, so easily Photoshoppable, that’s become the overnight icon. It’s the image that offers, in trending topic terms, a spike — a rupture, an irregularity, a breach of normalcy. It’s the image that demands, in trending topic terms, attention. And it also demands participation. A key feature of the Epiphanator, the mechanism of press-mediated storytelling that defined our sense of the world for so long, is its impulse to organize time itself into discrete artifacts. Journalists tend to be obsessed with beginnings and, even more importantly, endings. This is how we make sense of things. 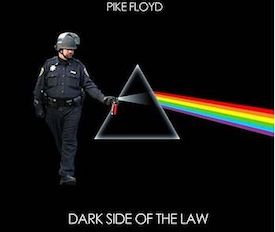 What’s notable about the Lt. Pike image, though, is how dynamic its path has been — this despite the defining stillness of still photography — by way of the complementary filters of social media and human creativity. The image of Pike (nom de meme: the Pepper Spray Cop) isn’t the first to reach a kind of iconic status when it comes to Occupy Wall Street. (It’s not even the first to involve pepper spray. See, for example, the horrific image of 84-year-old Dorli Rainey, her face dripping with burn-assuaging milk after being sprayed in Seattle.) But it is the first whose implicit narrative — one of struggle, one of outrage — offers viewers a kind of ethical, and tacitly emotional, participation in Occupy Wall Street. A moral drama that the protestors clearly won. Images, Susan Sontag argued, are “invitations” — “to deduction, speculation, fantasy.” They invite empathy, and, with it, investment. Images by Brian Nguyen, Billy Galbreath, Kosso K, the Pepper Spraying Cop Tumblr, and UnlikelyWords. POSTED Nov. 21, 2011, 2:30 p.m.
Garber, Megan. 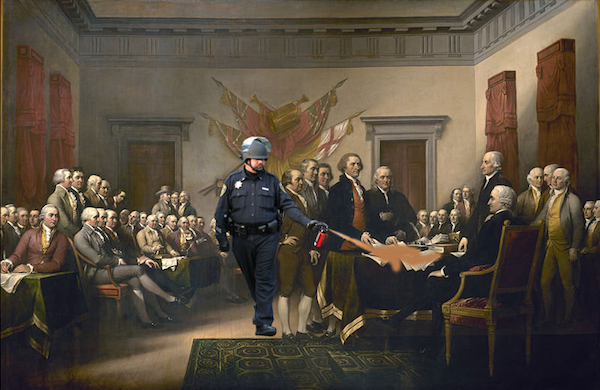 "Image as interest: How the Pepper Spray Cop could change the trajectory of Occupy Wall Street." Nieman Journalism Lab. Nieman Foundation for Journalism at Harvard, 21 Nov. 2011. Web. 18 Apr. 2019. Garber, Megan. 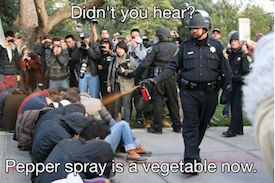 "Image as interest: How the Pepper Spray Cop could change the trajectory of Occupy Wall Street." Nieman Journalism Lab. Last modified November 21, 2011. Accessed April 18, 2019. https://www.niemanlab.org/2011/11/image-as-interest-how-the-pepper-spray-cop-could-change-the-trajectory-of-occupy-wall-street/.